One of my favorite things is home. Outside my window the sun is casting long shadows of blues and grays. I am thinking that my foot hurts. From the kitchen I hear the radio and that noisy clock ticking. I am wearing jeans, a turtleneck, a long sweater, and no shoes. I am reading a biography of a missionary written by his wife. Sometimes we have no idea who lives in our midst. I am hearing the furnace click off and now the blowers start up. I am hoping that the economy will improve and that people will be able to stop stressing. Around the room are deepening shadows and many memories. I am going to start preparing supper. I am creating a life, a story, and a table runner, not necessarily in that order. I am thankful to God for this good life, for family to love, and a home to care for. I found this meme at Cait's. Hers reads like poetry. You'll love it! As she encouraged her readers to try this, I also encourage you and let me know so I may read it. P.S. This meme is very similar to The Simple Woman's Daybook, though I see that some items have been left off. Even though I have known about the former, I never even gave it a thought reading Cait's Meme that it was the same. Probably because Cait turned hers into lovely poetry. Anyway, my sincere apologies to anyone who might have been offended. (I know that many of you do this on a weekly basis. I can't imagine ever doing it more than once so kudos to you!) I am linking to the Daybook without participating. I'm a quiet gal and can't handle too many parties. Great pictures as always. I wonder though what John thought of you peering over and taking that picture. He looks totally comfortable! I also wonder what your bananas are hanging on? Odd questions, I know, but I am curious. I really like your plate in the last picture, along with the teapot and lights. Looks warm and cozy! 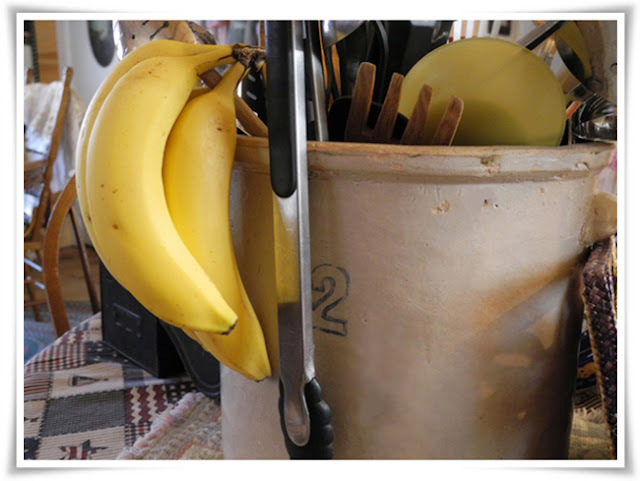 I have no room for one more gizmo in the kitchen such as a real banana holder so this is just a wooden spoon with its bowl down and the handle up providing a hook of sorts for the bananas to hang from. Morning Vee, warm wonderful post...love it......oh my, be still my beating heart, is that Friendly Village dishes I see, my favorite of old dishes, have some pieces but hard to come by, lucky you.......Blessings Francine. So many comforting things in those pictures. You truly have a gift when it comes to arranging ~ so welcoming! What a nice, calming post. I have sooo fallen down on my visiting since I am caught up in a whirlwind of paint, boxes, moving this and that and tossing at night with a full-to-the-brim mind. Forgive me and don't forget me thru all this absence. I love this meme....a long time back, there was a weekly meme like this. I can't remember who hosted it but it was fun. I could really enjoy relaxing in your home. I enjoyed your thoughts & pictures of your home. Cozy, warm, comforting, what a blessing. 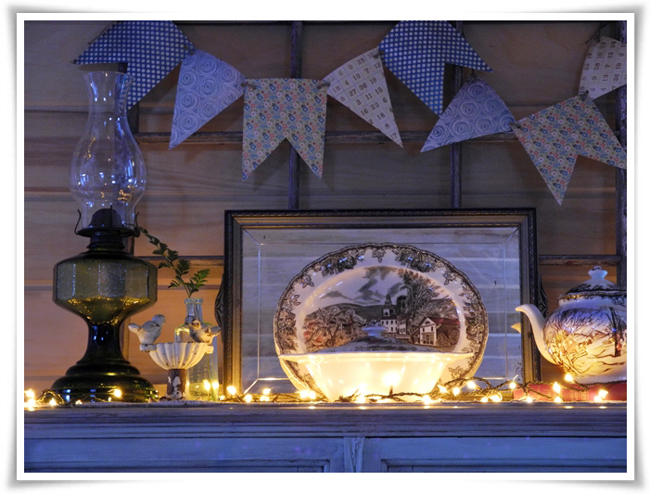 Beautiful photos Vee, of a warm and delight-filled haven. I think I may give this meme a go...I'll try to do it today. Lovely meme....I felt I was with you today. Thanks for linking me to something so beautiful, as is yours. Home is my favorite place; I don't think I could ever be bored here. I like your photos and notice who is tucked in the center of that beautiful image! Ah...the comforts of home! Great post...of hearth and home and all things comforting on a winter day. And I love the quote by BF. So true! Your cozy pictures of home match your feelings perfectly. This sounds like a great party, I'll check out the link. A lovely post. The photos are beautiful. I used to join The Simple Woman's Daybook each month for this meme. She has been running it for years. (Google on Simple Woman's Daybook and you can find the link to the blog). It makes you think about what is around you, what is important to you. Take nothing for granted. Think. Enjoy! Love the photos of your home. I also use to join the "simple womans Day book" I should do it again, it is very nice to see all the "simple pleasures" out there! Loved yours! What a lovely post!!! I enjoyed it so much. I have not heard of simple womans day book. I also love your picture thought..I see someone in his chair reading...what a great photo! You had me at "home". 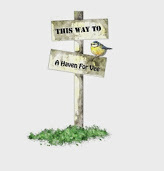 :D.
Your home is a place of comfort and beauty. I have always enjoyed reading this type of meme. Yours, too, read like poetry. The top of your china cupboad is decorated so nicely. I soo enjoyed this as always and the pictures were wonderful. I am going to go and check out your recommended blog as I think this would be wonderful put to poetry. Enjoy your day! Very nice. I might try this later today...after the taxman. Love the vignettes of your home that you've shared. Thanks for the link to my Meme Vee. I can't remember who did this meme originally so I couldn't link back to it but I am on the case! It certainly wasn't the Simple Woman's Daybook as I have never ever been there. (great title - I wil certainly check that one out!). I will let you know when I find my prompt, I know it's one of the blogs I visit regularly. I loved your meme and your photos of home are so beautiful and inviting. Vee, God is shinning his light on you.This post is wonderful. And thank you for stopping by with your sweet comments. Reading this post is like being wrapped in a warm blanket. So cozy and homey. Whether the meme comes from Cait or a Simple Woman's Daybook, your words evoke images of comfort and contentment. I especially like that you are not wearing shoes. I never wear them at home indoors - nor do most Canadians. It's that Canuck connection again! This is a lovely post, Vee, complete with lovely photos. Your home always looks so warm and inviting. I'll be trying out this meme before long, it looks fun and does look very much like the SWDaybook. Now I'm off to check out Cait's. Have a wonderful day! You make me feel warm and cozy whenever I visit! Photos and words! You just put a smile on my face, really! 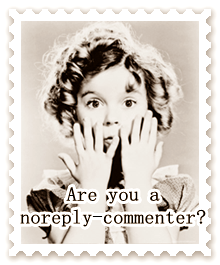 Some of your comments and the way you express is so 'point on'. Love it! Just stopping by to meet you and thank your for your sweet comment on my blog today. I'm following you... and I'll be back... it's just too comfy over here to not return! What a lovely post. I love your photos! I enjoyed reading your meme very much and it inspired me to do it also. Thank you so much for sharing. Thank you, Tori. I wish that I could read yours, but your profile does not link to your blog or, at least, I couldn't find it. That looks like a fun meme. I love the photos of your home it looks so warm and inviting. This post was just like a balm to my soul...I really enjoyed it and let it soak in, the joy of home! I too hope the economy does better...I am one who is under a lot of stress. The photos are so warm!!! Thanks for sharing home! Hello! I have popped over from Cait's blog. I love your take on this prompt she did today. Your home looks so cozy and warm. Your photography also reminds me Jewels' daughter, Rosie. You bring us into your home in such a lovely way. First of all, your new header photo is beautiful. I bet you did that with PicMonkey. I loved this post Vee. I love that word 'Home" too. In my post today I have houseshoes on the coffee table. Nope...good old Photoscape and some Photoshop. I do love those special effects at PicMonkey, though, and wish they all could be free. What a beautiful post. Love all the photos you shared! Home really is the place I love the most also! Oh Vee - what a beautiful meme!! Your home look so warm and wonderful and I can almost smell the woodfire candle. 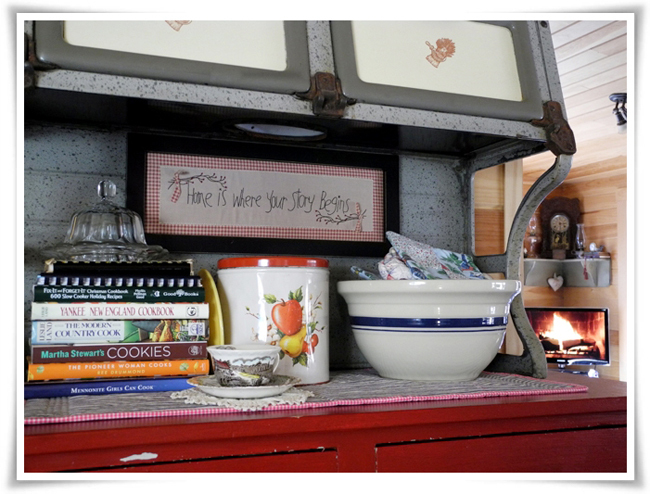 I love the vintage stove top on your jelly cupboard - my mom had one of those stoves! I like your style lady! Hi there! by blog hopping I discovered your blog.. I love your pictures so beautiful! and I feel the same way about my home... Its where the heart is.. I enjoyed every word and picture in this post. It made me feel so cozy and warm and appreciate my little house even more. It's funny when I owned my own home I never had the need to upgrade or move most of my friends have moved to better houses as there income improved but they say home is where the heart is and my heart is here. i can't imagine a more comfy, cozy home! your story . . . did you 'hide' it? This is so beautiful.....very moving and I feel as if I just left from a visit with you. I especially love that pic of John. I can see why it's a favorite. I've never done this type of post before but may try it next week when I am home! Lovely! LOVELY!! Lovely post, Vee. The pictures really spoke to me. Awwww, I love your home - it's so, so... homey! I still think your jelly cabinet with the stove thingie on top - that is so cool. Everything is just so YOU, Vee! Hope you guys are warm and cozy - looks like y'all are in for a big snow storm! Let us know you're all okay and the lights and heat are on! Hugs! Aww! That was very sweet! A beautiful post Vee. I love peeking into your home and your meme is beautiful. Good luck in the big snowstorm that is predicted there --I hope it isn't as bad as all the hoopla. Stay warma nd cozy! you've created such a warm home post with all your special touches! I've enjoyed your take on the meme too. 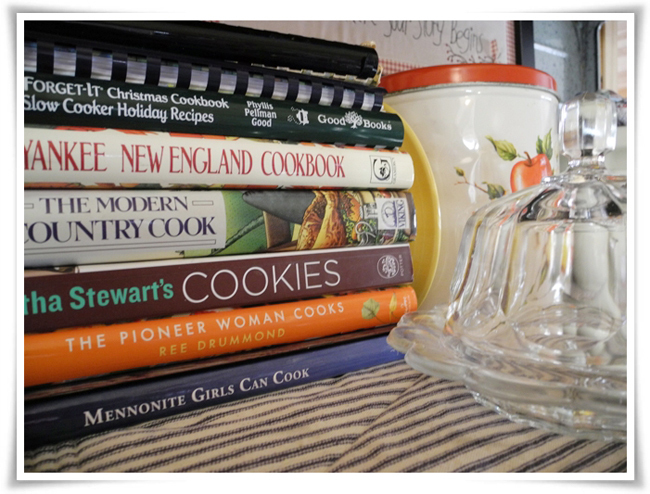 I spied a beautiful oval meat dish on your mantle - love these. Vee, I love the sentence starters idea -- and reading your thoughts. I may have to try that sometime. Nice post! You've definitely captured elements of "home." I am loving all of your photos! 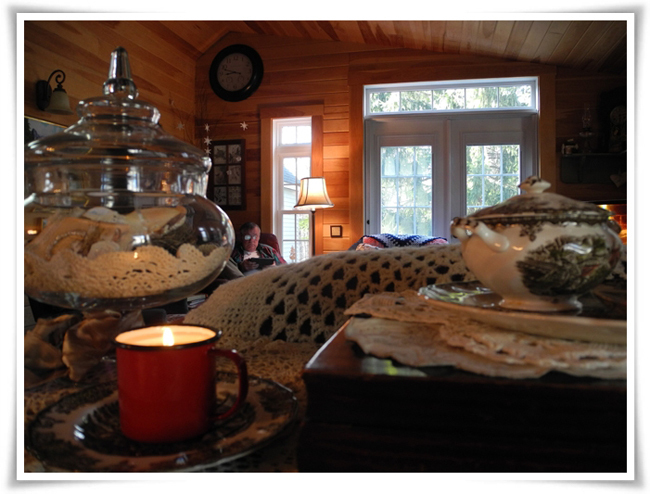 That was very cosy, very peaceful....very homey. I liked it a lot! What a beautiful post! Your photos are wonderful for capturing the love in your home. So much to love in this post, Vee. I thought of the Simple Woman's Daybook right away. My friend Judy and I used to email one another with our answers to this, weekly. Then we came up with our own questions/starters to use. We haven't done this for years. Both of our lives became much busier. All that to say, I did very much enjoy reading your thoughts here, and the photos are lovely, particularly the cozy one with John reading in the corner. How I wish we could have known him! But we will meet in heaven, I know. Always love seeing your Friendly Village; I have just a few pieces of it but love them. I liked the "Home is where your story begins" piece; have always loved that saying. And the pretty banner in shades of blue .. is that paper or fabric? I'm guessing you created it yourself -- care to share how? Love, love, love this post. Thanks for featuring it! The banner was made by a sweet young blogger named Sarah before she married and had two little darlings. Those darlings are often featured by their grandmother on Instagram. I'll send you the link. The banner is made from paper and I have safely tucked it away someplace that I can no longer find. The story of my life! Thanks for sending the link! I have requested to follow her. I've made several banners from paper (book pages mostly) and it's really fun. I keep them in ziptop bags in a particular closet, but I still sometimes misplace one. But it will be a joy to meet in heaven.